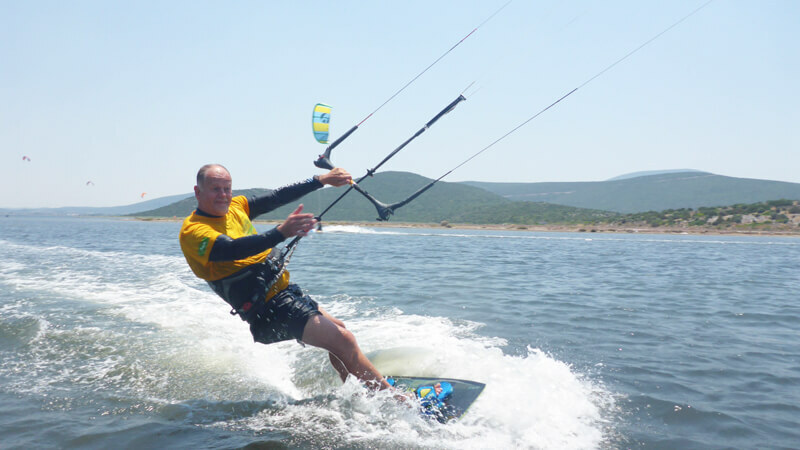 You’re 69 years old now and have been a windsurfer and catamaran sailor beforehand and started kitesurfing at 55. What led you to starting kitesurfing in the first place? So you didn’t have anyone show you a few basics or anything? You just watched the others and tried it yourself? So are you still windsurfing sometimes? 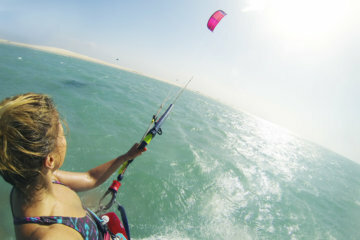 So what was special about kitesurfing for you, can you remember anything special from the beginning of the kitesurfing? 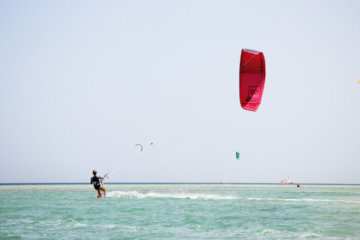 What thrills you most about kitesurfing, which feeling do you get? You are organizing kite camps all over the world. What kind of people are joining your camps and are they inspired by you? Do you have a life philosophy that is driving you? 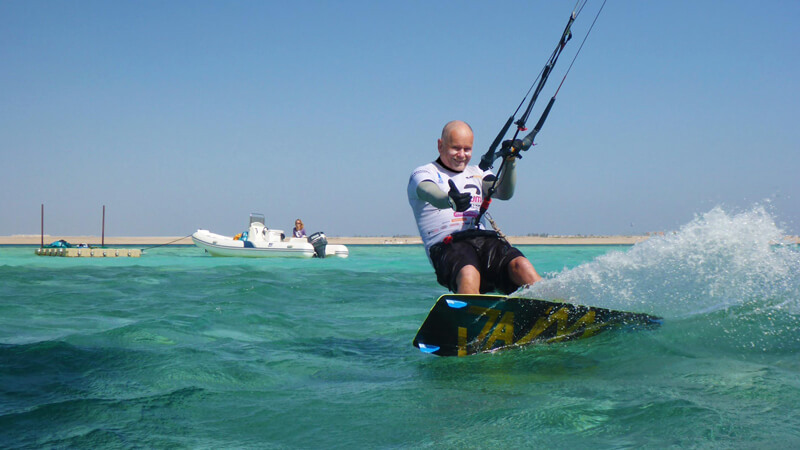 If you’ve ever done the windsurfing sport and I would say I was more than a proficient windsurfer – it’s very tough on the body when you get to a certain level which I was. And most people like to be windsurfing in high wind conditions, small boards and sails. Those conditions are never easily available and I was kind of getting to the point where I was finding the windsurfing hard work when I was doing it. I wasn’t finding the stoke anymore and despite the fact I had 8 boards and over 25 sails, I never seemed to have the right kit at the beach when I needed it. The kit simply wouldn’t fit on the roof of my car! I’m sure every windsurfer knows exactly what I’m talking about! I saw this kiting thing coming up on the horizon and I thought maybe I should just take it up for when the wind was low. I was out in South Africa in 2004 and met a guy selling a kite and I thought “if I don’t buy into it, I’m never gonna do it.” So he sold me this 14 m North Rhino, a real beast of a C kite. I got this thing, I tried it here and there but honestly I could never get it to fly properly. I did some crazy stuff which I’m not going to go into now cause I would never recommend anyone to do it. But in those days there weren’t the guidelines, the safety instructions, so you try anything. Correct – and that’s definitely not the thing to do guys! Anyway I could never get this thing to work so I went on a kitesurf course in 2005 and I tried again but just couldn’t get it. 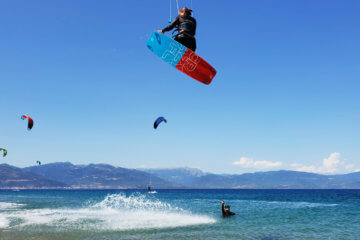 The fact of matter is: windsurfers pull, kitesurfers push. Windsurfing is all about upper body strength, pulling hard on the boom and sail . 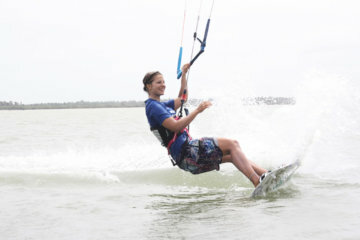 Kiting is more about using the body’s weight and small, easy movements. A light touch gets you everywhere. So I couldn’t get on with it to be honest. I was getting very frustrated with it. So I started kiting in 2004 and got going in 2006. That’s not a good progression, is it! 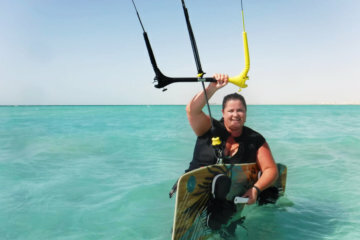 I just wasn’t really getting it, and was about to give up and stick with the windsurfing, when in 2006 along came Cabrinha with a new game changer, the Bow Kite. A fellow windsurfer got one and persuaded me to give it a try and wow, finally a kite with the feedback through the bar that I needed… this new bow kite had a completely different feel to the C kite that suited windsurfers absolutely perfectly, finally I was up and riding. I got up and riding and was totally taken by it. I could actually do things, progress, get better. Whereas with my windsurfing I was at the pinnacle, as good as I was ever every going to get. 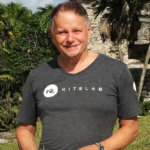 My fitness was dropping away and I couldn’t sustain, and kiting kind of filled the breach, I felt absolutely great and still do every time I get out on the water! I’ve sold all the windsurf gear, made some space in the car. Cause the thing with kiting is you can actually do it with a small car – with windsurfing you can’t. You can go places, go around the world with it and that’s the beauty with it as well. 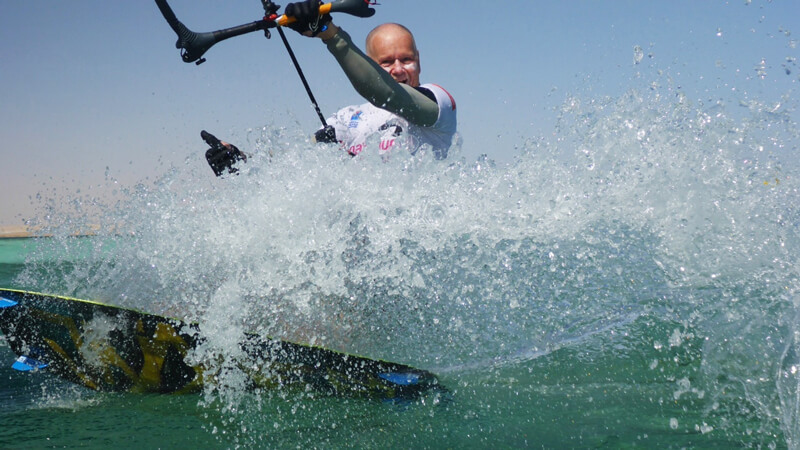 Kitesurfing is very much a personal scenario where you get your buzz because you’re doing it and it doesn’t matter how little achievement you are making. If you make one good move in a day – it stays with you, it’s really good. So it’s a very personal sport. It takes you by the heart, it takes you by all parts, everywhere, and you believe you can do things when you’re flying around. You feel completely different than I have every experienced in any other sport. That feeling of freedom, of personal success. The nice thing about kiting is it’s non-competitive. All the people I meet, they’re not full of themselves, they always want to help you, that forms a sport. Possibly because it’s so new and because it’s not structured in the same way as something like golf. 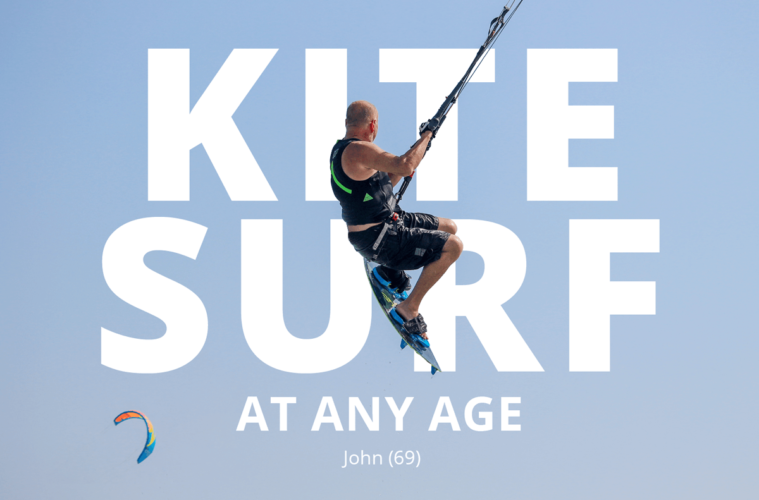 Kiting is finding it’s feet and people are enthusiastic about it. I always find people on the beach very helpful and I wanna take people of different age groups to that feeling that they can do stuff that they possible thought they couldn’t do. Terribly, badly! But I think fear is something that really comes at you when you have got no experience in a situation. As you gain experience in situations, the fear factor seems to be more controllable, so it does drop away. Well it’s pretty much with everything: you just do, don’t you? You surround yourself with people who are aware of you being there. The people that you meet on the beach, you’re going to meet on the water and those people will help you. As long as you have that confidence that you’re surrounding yourself with people who have an understanding about what you’re doing, you reduce the fear factor. You gotta realize: kitesurfing is a team sport, guys! It’s awareness of others and helping others. And if you take that to the water, be aware of who and where they are. Watch out for others. It’s kind of missing in some areas. For me now it’s about trying to bring new experiences to those people who are looking for their first or next step in the kitesurfing saga. My desire is not only to bring all ages to this great sport but to give you guys the platform where you can “enjoy the best and forget the rest”. The Flying Gecko Surfaries and Camps offer all comers the chance to visit the greatest destinations and conditions at the best times of the year. 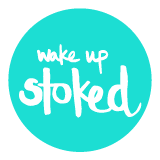 They appeal to those looking for a real kiting adventure and who want to immerse themselves in the sport at least for a week or two at a time. It seems to suit free spirits of both sexes and is particularily attractive to couples and single ladies of all ages. I’m not trying to push the edge of the sport but believe by showing that I can do it as a 69-year old, people realize that they are able to do it as well. It’s such a connective sport, it crosses all age groups, there is no social boundaries. It opens the fields. There are a lot of people in their 40i’s or 50’s who tell me on the beach they’re inspired by me, who are just coming into the sport and see an old guy like me getting out there, getting hammered and not worrying about it because at the end of the day if I can do it they can do it. But I want to tell the guys out there that are past 45, let’s say, they think they’re past doing something challenging in sports. Kiting is the one thing you can really get a buzz from at any level. You get a buzz that moment you get up on the board. I think… I’m driving myself. At the end of the day, my drive is to better myself each time. Most of the problems are in your head and if you can rise above that, you get out on the water, you forget all kinds of inhibitions, it’s a personal enjoyment and I’m able to still do it. John offered a 50 Euro voucher (for bookings over 500 Euros) if you use the Voucher Code WUS for one of their camps or kite safaris.